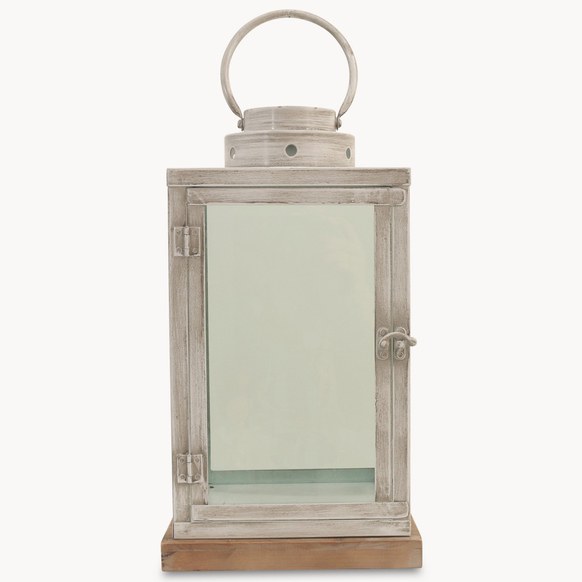 A lovely white washed metal lantern with a wooden base. The simplicity of a single candle makes it ideal indoors or outside on a balmy summers evening. Product Code: 21270. Categories: Living, Home Accessories, Lanterns, Hurricanes, Candles, Dining, Home Accessories, Lanterns, Hurricanes, Candles, Bedroom, Home Accessories, Lanterns, Hurricanes and Candles, Outdoor Living, Outdoor Accessories, Lanterns / Hurricanes, Accessories, Home Accessories, Lanterns, Hurricanes and Candles, Lanterns / Hurricanes.